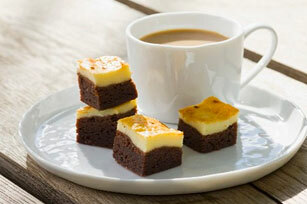 Separately, cheesecake and brownies are strong contenders in the favorite dessert category. Together, they clinch the title easily. Line 8-inch square pan with foil, with ends extending over sides. Microwave chocolate and butter in large microwaveable bowl on HIGH 2 min. or until butter is melted; stir until chocolate is completely melted and mixture is well blended. Stir in 1/2 cup sugar. Add 2 eggs and 1/2 tsp. vanilla; mix well. Blend in flour. Spread into prepared pan. Beat cream cheese and remaining sugar in medium bowl with mixer until blended. Add remaining egg and vanilla; mix well. Spoon over brownie batter in pan. Bake 35 to 40 min. or until toothpick inserted in center comes out with fudgy crumbs. (Do not overbake.) Cool completely. Use foil handles to lift brownie from pan before cutting to serve. Drop 1/4 cup raspberry jam over unbaked cheesecake layer by teaspoonfuls; swirl with knife. Continue as directed. Stir 1/2 cup chopped toasted PLANTERS Walnuts into brownie batter before spreading into prepared pan.